I was spending too much time in my home office this morning, shut off from fresh air, moderate temperatures, and sunshine. So I headed out, camera bag in tow, to lunch at Chipotle's and a mini-tour of nearby nature areas. 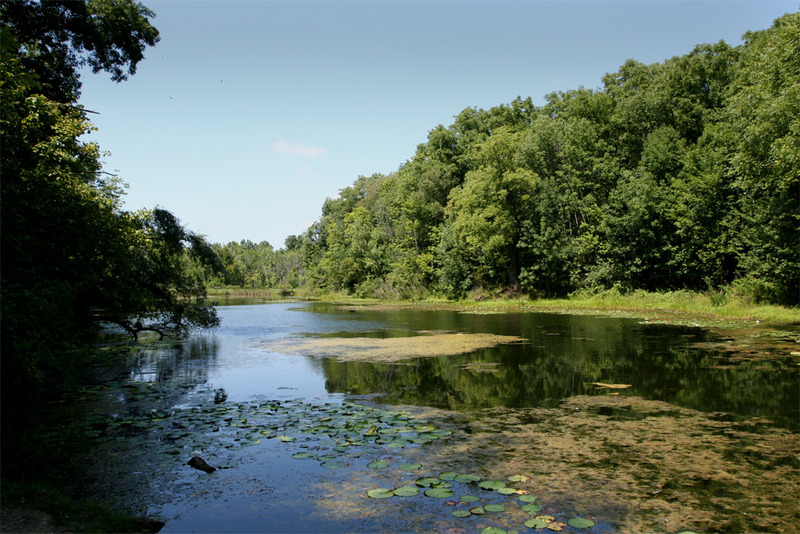 First was the Strongsville Wildlife Area, a wetland with restricted access in the form of a permanent observation blind for public use. From there I watched an egret hunting and catching small fish. An elegant white swan floated nearby amongst a small crowd of raucous ducks. I used the telephoto to capture a few photos there and of bees collecting pollen and nectar from plants along the path. Then it was on to the Wallace Lake area of the Metroparks, seeking a great egret I frequently see there. That bird is particularly shy when I'm there with a camera but close to the path and road when I'm on a commuting trip. Today was no exception. I shot a few photos of the bridge to downtown Berea and the water fall (lens tests and "art"), a few of the distant egret, then off again towards home. Along the way I spied the sign I regularly pass: "Cleveland Metroparks System / Beyer's Pond." Never been there. Have time? Yes! So I did a three-point turn on the quiet road, pulled into the lot, and hiked down the soft mulch-covered path. Beyer's is a beautiful body of water –still and dark– with lily pads and flowers in the quiet ends and wood duck nest boxes staked here and there. I didn't see much in the way of wildlife but shot a few photos of the water, lilies, flowers, and bees. Finally off for home. I'm preparing for a special public event tonight: Perseid Meteor Watch. The participating park system assigned us to a tiny county park. If we get a decent turnout, we'll be turning people away! Weather looks good. Must remember: telescope and all components (for looking at non-meteoric objects), camera, tripod, descriptive hand-outs, etc. The event runs from 9:30 to 11:30 PM so I'll probably be getting to be at about 1:30 AM tomorrow. I took today and tomorrow off. As for the Canon Zoom Lens EF 17-40mm, f/4 L USM lens … well, let's just say I'm not thrilled with its performance now that it's back from a $100+ repair trip to New Jersey! My nature hike/test images today do not tell a happy story. The lens has significant chromatic aberration, does not seem to focus well across its field of view, and does not seem to consistently auto-focus. It works best in close quarters but not for panoramic landscapes. I've no choice but to use it tonight, hoping for a bright meteor streak or two but I'm not encouraged by what I'm seeing thus far. It was too cloudy here last night to see the show (assuming we managed to get away from the light). It looks as though it is going to be cloudy again tonight. I hope you have clear skies. A few years ago we got up around 3am and walked from where we were then living to a park. We lay down on park benches and just watched the sky for an hour – even with the light it was quite wonderful. BTW – the hurricane that was aiming for Hawaii disintegrated and changed direction. The astro-dweeb got his full component of nights in. As you say every night is really valuable.